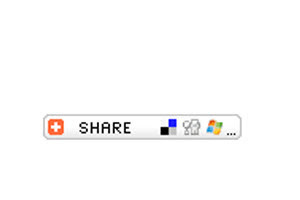 Do you have your ADDTHIS widget yet? 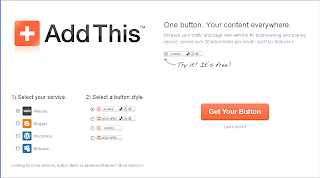 Addthis.com is a free service that allows you to install this discrete 'button' on your blog (see below) or website and enable the sharing of your content across all of your social networking sites. "We currently support over 50 services including: Blogger, Delicious, Digg, Facebook, Google Bookmarks, Live, MySpace, StumbleUpon, Twitter, and many more. We're contstantly adding more services to AddThis, so you don't have to" quoted from the addthis website. With an impressive list of support and compatibility with all of the sites to the left this is a 'must have' widget for anyone wanting to share their content all over the internet and generate more traffic to their website or blog. 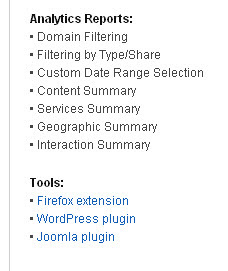 Addthis also has a series of extras including these neat analytics and tools. This allows the user to keep track of exactly where their traffic is coming from and when. Your widget is customisable and avialable in 20 different languages with safety and security guaranteed. 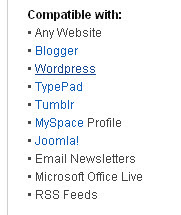 Some of the social networks supported!